Recent events have compelled me to reflect on the world we live in. We’ve come a long way in terms of technological advances, yet we have made little progress in some other areas including race relations. We can fly to Mars, yet we can’t live in peace on earth. How ironic! How sad! Now, more than ever, and for the sake of our generation and future generations, we must wake up to the reality that equality, fairness and justice are not universal. Some of us (humans) have an uphill struggle to get so-called basic human rights. How ironic! How sad! Call it out for what it is! No sugar-coating around me please. Don’t tell me about “unconscious bias”, I am talking about conscious and blatant discrimination. Racism and other discriminatory attitudes and behaviours are real! You’re kidding yourself if you think otherwise. 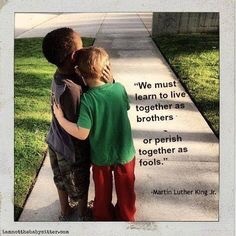 Dr Martin Luther King Jr eloquently prophesied that “we must learn to live together as brothers or perish together as fools”. Next Post I’m Like a Stepping Razor – Don’t Watch My Size. I’m Dangerous!! !